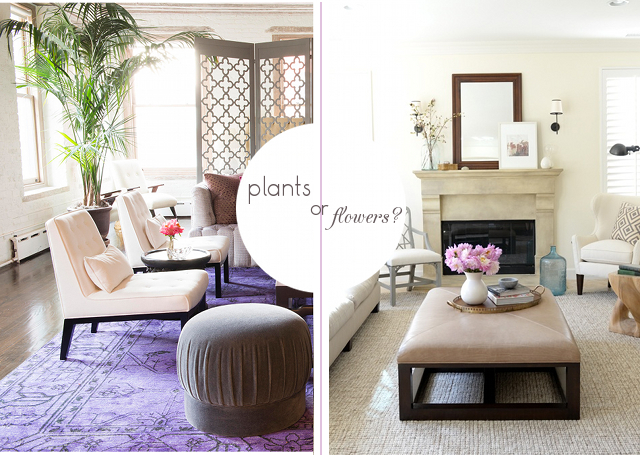 When it comes vegetation in the home, do you prefer flowers or plants? I recently had a conversation with a friend who grew up with house plants and loves them, but I've never been a fan. They always just seem...kind of dirty to me? I much prefer the life, color and texture that a pretty bunch of flowers bring to a room. Plus, a new arrangement can add big impact for a very little price - my favorite part! So, which do you like? How do you incorporate plants and flowers into your home? Definitely a flower girl! I try to have fresh flowers in my little apartment all the time, it's amazing what it does for the feel of your home and my mood!